For every discerning traveller, where you stay is just as important as the destination when booking a holiday. No point in going to a fabulous destination and slam it in a mediocre or below average hotel. That alone would ruin your vacation, atleast I know for sure that it would ruin mine. Recently I had the pleasure of visiting Tel Aviv for their annual Gay Pride festival and as I booked my flight, my mind started wondering which of the hotels on Tel Aviv’s expansive beach front including the Hilton Tel Aviv, Carlton, Intercontinental and the Sheraton I should stay in because whereas there are many nice boutique hotels inland, there is no point in visiting one of the best beach cities in the world and staying anywhere other than the beach. As I considered the fore mentioned 5 star hotels, my instinct kept bringing me back to the Hilton Tel Aviv hotel. A hotel built fifty years ago and usually called the generation hotel because many of the clients have visited from their childhood and still continue to visit to this day with their new families because of the good memories accumulated from staying at the same hotel over the years. 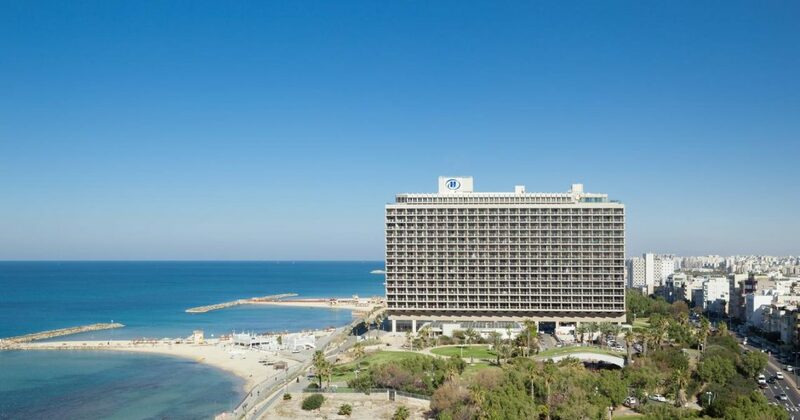 That and the fact that the Hilton Tel Aviv is right in front of the Hilton Beach where all the festivities of the week where taking place and of course the glowing reviews on each and every internet platform imaginable trip advisor et al. 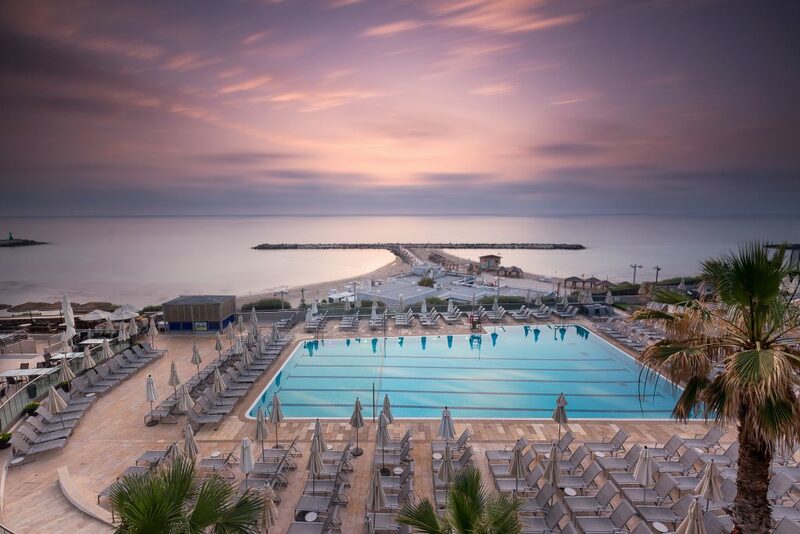 There are various reasons to visit Tel Aviv which in my opinion is the most cosmopolitan city in the Middle East including the glorious weather, beautiful people, the delicious food, security etc but I must say that I will confidently add Vista at the Hilton as one of the reason one must visit and stay in Tel Aviv. Vista at the Hilton is nothing like you can find anywhere in Tel Aviv. It is what I term as a ‘hotel within a hotel’. 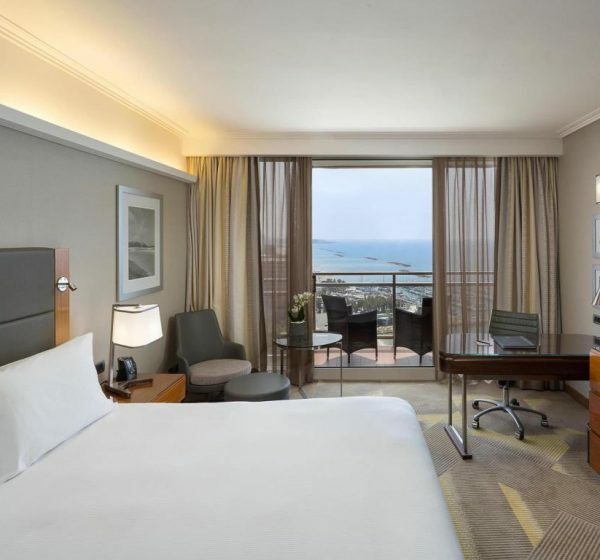 Where as most of the hotels on Tel Aviv beach are 5 Star, none compares to Vista at the Hilton in Luxury. I arrived in the afternoon at the Hilton Tel Aviv mid afternoon in the scorching Israeli sun, I was warmly welcomed by name by the reception manager who led me to the elevators as the delightful bell boys disappeared with my luggage. Quite shocking as most hotels would not allow you anywhere close to the elevators without checking in. My mind was quickly out at ease as the manager informed me that as a Vista at the Hilton guest, I did not check in with the rest of the Hilton guests. 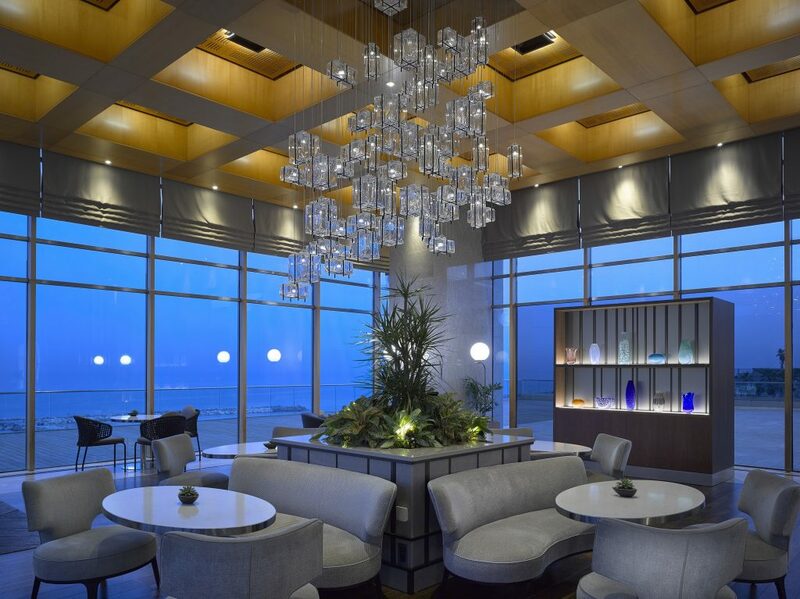 Tucked away on the 17th floor of the hotel is where Vista at the Hilton guests are checked in in the privacy and comfort of the Vista lounge. 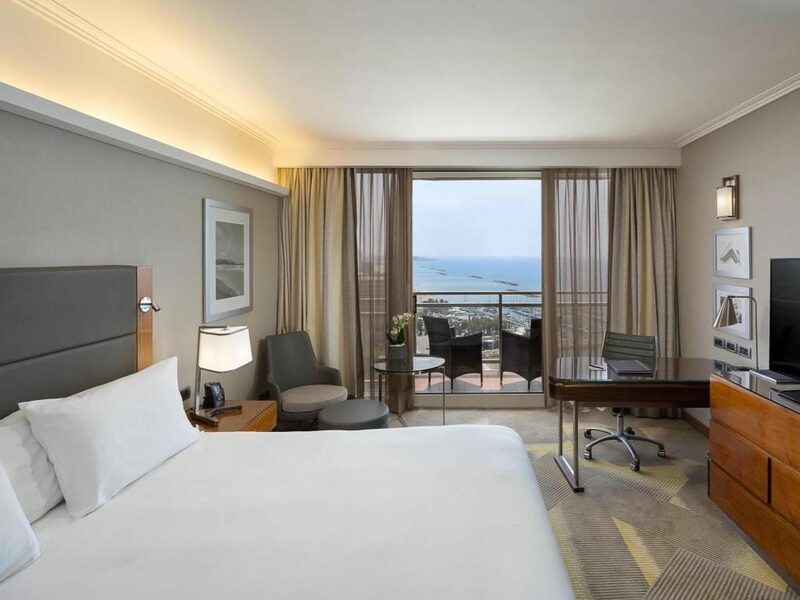 Vista at the Hilton occupies the upper five floors of the hotel with 167 rooms that have the best views of the Mediterranean Sea. On arriving at the Vista lounge, I was offered a glass of champagne and nibbles while I waited for my check in to be finalised. I was then escorted to my room on the 13th floor where a huge double bed, a complimentary fruit platter and bottle of Israel red wine awaited my arrival. My room was spacious with floor to ceiling sliding glass doors that led to a balcony overlooking the beach. The marble bathroom was super with a separate shower and deep bath tub big enough to accommodate 3 of me. The room decor was modern contemporary with a huge king size bed that you never want to wake up from and the heritage of Israel and culture is spread across with paintings of various ancient Tel Aviv sites hung on the walls. One of the many attractions for staying at Vista is the hospitality in the vista lounge which opens from 6:30am with a lavish breakfast of fresh fruits and a selection of hot food. Also the presence of caviar was not lost on me as I navigated my way around the huge buffet table. 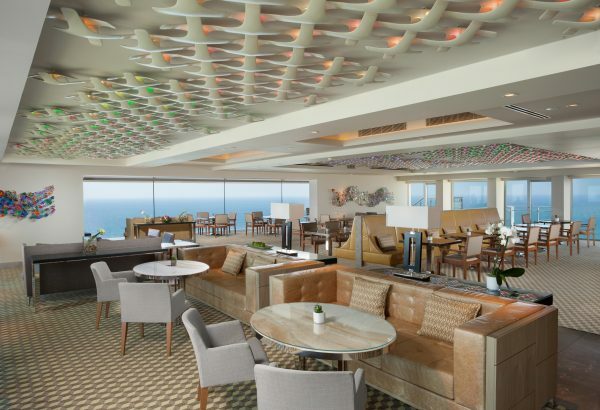 Healthy snacks are then served from midday to 3pm after which a dairy buffet of Israeli culinary goodness is served from 6pm to 8:30pm however guest can help themselves to hit and cold beverages throughout the day with alcohol only served from 12:30 to 11pm. This alone could have made me stay in the hotel all day and night but the streets were buzzing and I was not about to miss any of the festivities spread around the city. 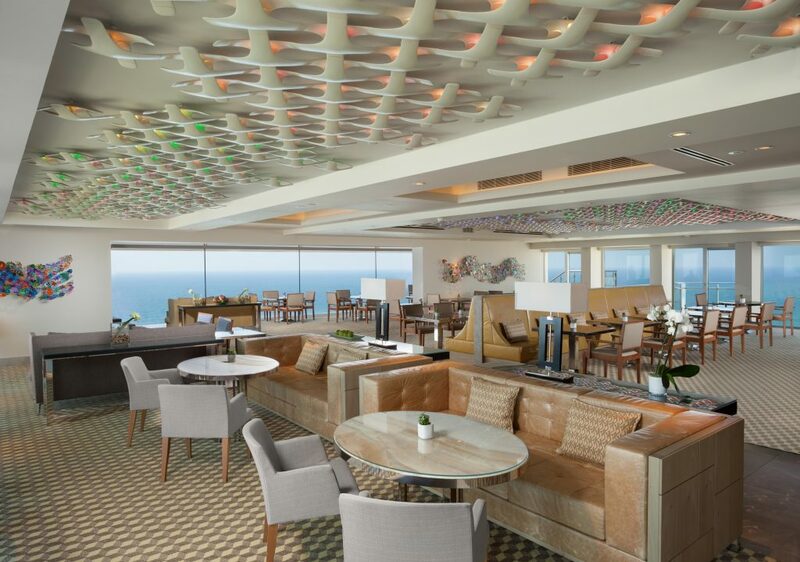 Aside from the Vista lounge, guests are welcome to try out the 5 other bars and restaurants within the hotel including Japanese restaurant Yakimono, Cafe Med, Chloely’s; the meat restaurant that is open only in the evenings, the lobby restaurant, and the terrace which offers spectacular views of the sea and and is the perfect spot to either have a light lunch or an evening cocktail as you watch the sunset. For activities, the Hilton offer a swimming pool with salt water pumped directly from the sea and the best spot to mingle with other hotel guests, a Thai Spa called Shiva with the best Cinderella type of history that is told to visitors as they have their mani and pedicures. There is also a fully equipped gym that is open to guests with floor to ceiling windows looking out to the beach. Unlike anything I have seen in any hotel, the Hilton also has a medical centre on the premises not just for the occasional accident and fist aid administering but guests can pre book with various consultants from any fields ranging from cardiology, cosmetic surgery, neurology, gynaecology etc as some guests visit the hotel to relax after an illness or for some post operation recovery. This was not my first time in a Israel but my first time in Tel Aviv. I must admit on my last visit the hotels in both Jerusalem and Dead Sea left me wanting but not the Vista at the Tel Aviv. It possesses a different luxury vibe not found anywhere else in one of the most amazing cities in the world. 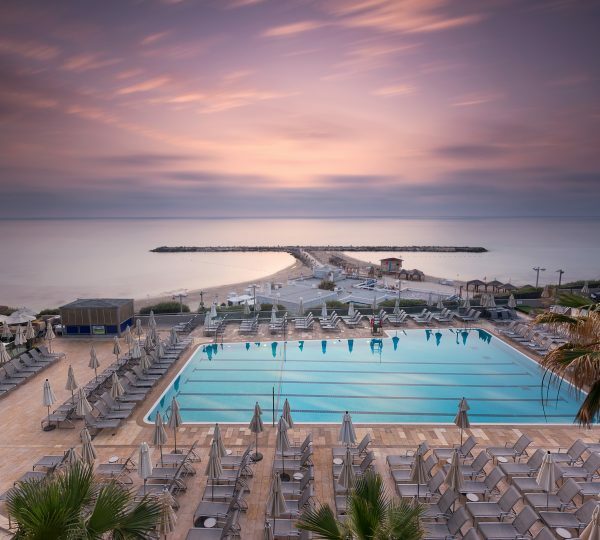 The attention to detail and highly skilled staff would lead me to recommend the Vista Tel Aviv to anyone that is considering visiting the ‘White city’ and is looking not just for the best but the best of the best that Israel has to offer.